Samsung Galaxy S8 VS iPhone 8: Which one is better? Home Comparison Samsung Galaxy S8 VS iPhone 8: Which one is better? 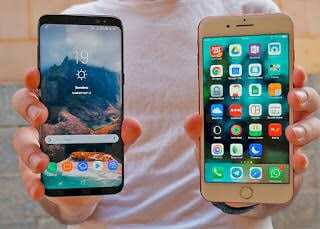 Samsung Galaxy S8 VS iPhone 8 – A classic tale of Android vs. iOS: The iPhone 8 and Galaxy S8 will be going head to head in this article. We’ll be looking at their various specifications and features and try to compare and contrast them. Both phones were launched in 2017, with the Galaxy S8 coming out first, before the iPhone 8 came later in the year. They are both amazing devices with top-notch specs and features. So it all depends on your preference when buying a smartphone. The Galaxy S8 has a headphone jack and a microSD card slot which you won’t find on the iPhone 8. Aside that, the Galaxy S8 sides is a bit wider with 8.0mm thickness compared to the 7.3mm thickness of the iPhone 8. The overall body of the two device is covered up in aluminum to give you that shinny look. With the Galaxy S8 having a nice and sleek curved edges. Both device are water and dust resistant. The IP68 rating of Galaxy S8 lets it survive under water of 1.5 meter depth for up to 30 minutes. While the iPhone with a IP67 rating enables it to survive under water of 1 meter depth for up to 30 minutes. This feature would be interesting to people who like taking pictures inside a swimming pool. The rear camera of the iPhone 8 is positioned at the top left corner, with the quad-LED dual-tone flash. While on the Galaxy S8 you will see the rear camera at the top-middle, with the LED flash placed horizontally on the left side of the camera. Galaxy S8 at 155 grams is slightly heavier compared to 148 grams which is the weight of the iPhone 8. You can get to choose from 5 different colours (Midnight Black, Orchid Gray, Coral Blue, Arctic Silver, Maple Gold) with Galaxy S8. While iPhone 8 only offers you just Gold, Silver and Space Grey colours. Most times, the display is where you would notice the biggest difference between phones from different brands. The iPhone 8 comes with a 4.7-inch 750 x 1334 pixels in screen resolution and 326 pixels per inch density. This is where the Galaxy S8 is far better than the iPhone 8. With a 5.8-inch 1440 x 2960 pixels and 570 ppi density. Images and text will tend to appear sharper on Galaxy S8 due to a higher pixel density. Both phone models sports a significant bezel on the top and bottom end with glass front and back panels. We have to give it to Galaxy S8 as they maximized the screen to body ratio at 84.6%. While that of iPhone 8 is at 65.4%. The Galaxy S8 rear camera is equipped with a single, 12-mega pixel with f/1.7 aperture. The same single 12-mega pixel rear camera can also be found in iPhone 8. Only difference is that the iPhone 8 comes with f/1.8 aperture. In this category, the Galaxy S8 will capture image better where there’s low light. For the selfie lovers, the Galaxy S8 would be your choice for that perfect selfie picture. It comes with a 8-mega pixel front camera with f/1.7 aperture. With the iPhone 8 having a 7-mega pixel front camera with f/2.2 aperture. The iPhone 8 is powered by a Apple’s most powerful A11 Bionic chipset with Hexa Core (Dual core, Monsoon & Quad core, Mistral) processor. This A11 bionic chip is much faster especially in opening large files compare to the Qualcomm Snapdragon 835 with Octa-core 2.35GHz processor found in Galaxy S8. The Galaxy S8 should be your preferred choice if you need a long lasting battery. It has a non-removable Li-Ion 3000 mAh battery with a talk time of up to 20 hours. While powering the iPhone 8 is a non-removable Li-Ion 1821 mAh battery with a talk time of up to 14 hours. The Galaxy S8 goes for about $650 (N230,000) which is relatively cheaper than the iPhone 8. You can get the iPhone 8 for around $785 (N275,000). In my opinion, i would say the Galaxy S8 offers more value. It has better battery, camera and display quality than the iPhone 8. What is The Current Samsung Galaxy S8 Price and Availability Status? You can click on the links below to view latest Samsung Galaxy S8 price & availability.